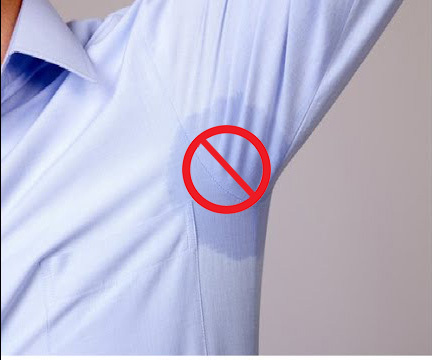 When underarm sweat starts to wreak havoc on your clothes and confidence, you need a solution and fast. No one wants to spend hundreds of dollars replacing or constantly dry cleaning expensive shirts. This is where dress shields can help. Sweat is an unavoidable fact of life. We all sweat in one form or the other. Now during these hot summer months we don’t need sweltering temperatures nor stress to get us down. 1. Does it contain sweat-blocking materials? Natural fibers like cotton and bamboo soak up moisture so it doesn’t show through your shirt. 2. How does it attach? Always find out what you’ll need to attach the dress shield to your body or shirt before purchasing. 3. How much area do they cover? Matching the size of your dress shield to your armpit area can be tricky. Do your research to find the appropriate size. 4. Are they reusable or disposable? While most dress shields can be washed and worn multiple times, some are disposable. If you're looking for long-term use, verify that it's reusable. WILL DRESS SHIELDS REALLY WORK? Dress shields actually date back to the mid 1800s. Kleinert’s was the inventor of the first Dress Shield. While dress shields typically work best for the everyday use the way they work can depend on some factors. Positioning for one, the way you attach it, etc. You may need to try a few ways before you settle on a method that works best for you. Some dress shields are made for a light-moderate sweater and others are made for people who sweat more heavily. Instead of attaching a loose dress shield to your clothes, Kleinert’s offers an alternative to sweat protection our sweatproof undershirts for men and women. Containing underarm sweat shields which contain 4 layers this system traps heat and moisture and allows it to evaporate rather than seep through your clothes. Because the sweat proof properties are native (not made with chemical treatments found in many water-repelling fabrics), they won’t wash off over time. Unlike a dress shield which may or may not stay in place, Kleinert’s sweat proof technology stays put throughout the day, so you don’t have to reposition the pad or worry whether it’s visible to others. Most importantly, you eliminate embarrassing wet marks and pit stains to your fine garments. To purchase and learn more click here.